For small business owners interested in aiding the recovery efforts in Japan, the American Red Cross is certainly an option -- and a good option at that. But there are a number of other organizations out there angling to help you help the people of Japan. Two wedding websites Utterly Engaged and Ever Ours created For Japan With Love to both help raise funds to aid the recovery effort in Japan and connect with other bloggers in support of the cause. So far, Lydia Yeung, Ever Ours' editor says that For Japan With Love has raised more than $5,500 -- its initial giving goal -- for ShelterBox, an organization that supplies emergency shelters and supplies to families around the world who are affected by disasters. Then, on Friday, the sites are coordinating a moment of silence among bloggers. Out of reverence for the Japanese people who've perished in last week's earthquake and tsunami more than 100 bloggers have vowed to keep their sites post free. For those interested in lending support, check out reach out to Ever Ours or Utterly Engaged. Online bakery Baking for Good already gives 15% of each purchase to charity. 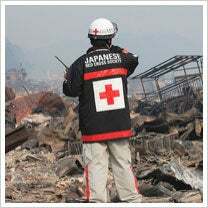 However, in light of the recent and ongoing destruction in Japan, it is now giving donations to Mercy Corps, which is providing emergency assistance in affected areas in conjunction with long term partner Peace Winds. Emily Dubner, Baking for Good's founder and CEO adds that customers may also increase the automatic 15% donation that the company makes. "We have been touched this week to see customers adding $5, $10 and even $100 to their contributions to Mercy Corps." Or, you could even start your own doing-good cooperative. The Digital Signage Industry which includes several out-door advertising agencies, networks and producers have joined forces to offer free content and public service announcements to networks who have digital signs in public places. The goal is to encourage passersby and customers to donate to the Red Cross via texting 90999. The group also recently launched the website Dooh4Relief to explain their communal efforts. Let's not forget man's best friend. Camp Bow Wow, a dog day and overnight camp out of Boulder, Colo., is throwing its support behind the National Search Dog Foundation, a non-profit animal search and rescue organization, which currently has a team in Japan’s coastal city of Ōfunato searching for dog and cat survivors. Through Camp Bow Wow's non-profit, the Bow Wow Buddies Foundation, the company is collecting donations for the Search Dog Foundation through the end of the month. How do you think small business owners can best help Japan? Leave a comment and let us know.